Perhaps the most well-known halal burger joint in Toronto, The Burgernator is located in Kensington Market on Augusta Avenue. Although the restaurant opened back in 2013, they recently revamped their menu in early March of this year. They introduced newer, bolder flavour combinations that emphasize their identity as a one-of-a-kind stop for adventurous halal burgers. The Burgernator has broken down its menu into four different sections: B.M.D. Burgers of Mass Destruction, Classic Arsenal, Vegetarian and Sides. The Classic Arsenal section consists of four burgers with seemingly military style names such as the Sergeant Burger, which consists of a beef patty, burgernator sauce, lettuce, tomato and pickles, falling just under $6. Although these options are easier on your wallet, it’s not a true Burgernator party until you take a visit to the B.M.D. section of the menu. Selections range from The Bazooka Junior: beef patty, fried egg, sautéed hot peppers, cheese and spicy chipotle aioli, to the Drop Down and Give Me Spicy: double beef patty, chipotle barbecue sauce, cheese, onion rings and sautéed jalapeños. However, if you’re like me and are scared of the lasting effects of red meat (hello pimples, yes I’m talking to you), then never fear, The Resistance is here! A burger stuffed with grilled cajun chicken, cheese, hot pepper salsa and chipotle aioli all ready to hop into my tummy. The Burgernator caters to vegetarian diets as well, which is hard to believe after reading the contents of their self-named burger - I’m talking three beef patties with caramelized onions and sautéed mushrooms tucked in between two grilled cheese sandwiches. If these contents initiate your gag reflexes, for either diet or health reasons, take a trip to the Battlefields, a burger with a crusted portobello mushroom stuffed with cheese and fresh herbs, topped with veggies, roasted garlic and rosemary aioli. 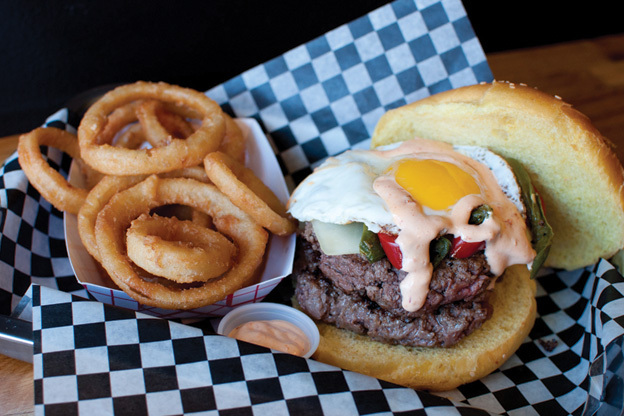 Located just steps away from Ryerson University, Jackson’s Burger has been serving Torontonians with their unique menu of halal burgers since January 2014. This burger joint is perhaps the least well known of all the restaurants on this list, however what they may lack in popularity, they make up for in taste and quality. Their beef is hormone and antibiotic free, with the patties made fresh at the time of order. The quality is evident in the flavour, when you bite into a burger you can clearly tell has no old or previously frozen ingredients. The menu at Jackson’s Burger differs from that of other restaurants, as they have an “Internationals” section, consisting of burgers that highlight special ingredients from different countries around the world. The “Effin’ Jerk” burger consists of jerk chicken covered in jerk mayo, with a pineapple salsa garnish. “Canada Eh!” is a classic Canadian burger stuffed with grass-fed beef, bacon, egg and fried cheese. The seemingly weirdest burger on the menu? “Damn Skippy” has a beef patty that’s garnished with peanut butter and strawberry jam. For those looking for more traditional burgers, the restaurant does have a classics menu that lists anything from a regular cheeseburger to a fish and chips burger, crispy chicken or a vegetarian patty. These can be topped with your choice of free sauces and toppings, or, if you’re willing to pay a little extra, a range of premium toppings including caramelized onions and sautéed mushrooms is available for you. These are all conveniently laid out on a screen at the cash register for customers to browse through as they order. My favourite thing about Jackson’s Burger? Their loaded fries. The “Effin’ Poutine” comes with fries, jerk chicken, cheese, gravy and jerk mayo. It might sound like a weird combination, but after one bite my mind seemed to leave my body and I scarfed the rest down before I could even tell what was happening. Suffice to say, it was not my best day (even though it felt like it was). This section of the menu also offers the “Shroom Daddy,” which is just regular poutine topped with sautéed mushrooms and onions, along with Chipotle and Sriracha Poutines. And, like any good burger joint, they offer delicious cold milkshakes to cool you down in order to maybe forget the hot, greasy food you just stuffed down your gullet. The youngest burger place on this list is quickly rising up through the ranks of Toronto’s burger game as its handmade patties and sauces win the hearts of almost anyone who walks in the door. Ozzy’s Burgers is owned by Ozgur Sekar, who formerly worked at another halal burger joint in Kensington Market, Top Gun Steaks and Burgers. Sekar opened Ozzy’s and made it his mission to develop a menu filled with unique burgers with risky flavour combinations, each dripping with cheeses and sauces that make your mouth water just by looking at them. Although the restaurant does not have a website yet, their marketing is mainly done through their social media platforms that showcase how they make their burger patties fresh in-house everyday. The beef is ground daily and formed into 6 ounce patties as needed. Their menu consists of both built-up burgers and large steak sandwiches, such as the Son of a Bun, a beef patty topped with chicken strips, caramelized onions, jalapeno, cheese and garlic and chipotle sauces. The Ozzy-licious Sandwich bursts apart at its seams, stuffed with Canadian ribeye steak slices, onions, mushrooms, hot peppers, cheeses and of course, is then drowned with sauce. Perhaps the best thing about Ozzy’s, aside from how each of their burgers seemingly fall apart due to how loaded they are, is that they employ members of both the refugee and LGBTQ+ communities.